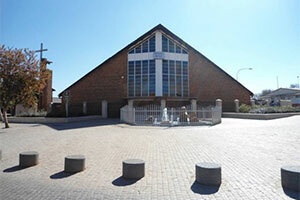 Tour features: Soweto Township, Regina Mundi church, Soccer City. You know the name. It’s a legend. 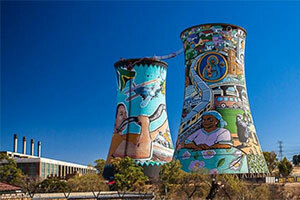 SOWETO, acronym for South Western Township, is home to over 2 million people, who, despite living in crowded and chaotic conditions, have a tangible sense of community, one which ironically, the ordered, walled, elitist northern suburbs lack. 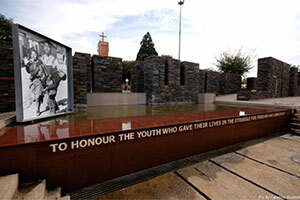 Inside Soweto, we visit the Hector Pieterson Museum, and discover the cause of the tragic riots which led to his death; we pass Mandela House and give you time to visit this fascinating little museum (own account +/- R100). Our journey continues to Regina Mundi Church, site of many secret underground meetings of the then banned political parties. Finally, we take you past the largest stadium in Africa, Soccer City, host of the 2010 FIFA World Cup opening and final matches. 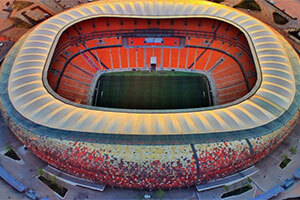 This magnificent stadium, also known as ‘The Calabash’ has a seating capacity of almost 95,000. Comments Soweto is unlike a suburb you’ve ever seen or been to, yet the history of struggle encapsulated here is a cornerstone of the South African story.